Find out the correct number to replace the question mark. You are correct. The answer is 9. The first line has 3 bears with hats totaling 21. So a bear with a hat is 21/3 = 7. The next line is 2 sets of a bear in a bus plus a bear in a hat totaling 19. So we know a bear in a bus is (19-7)/2 = 6. Next is a hat, a bear in a bus, and a bear in a hat totaling 15. So we know a hat is 15-6-7=2. A hat is 2, a bear is 5, and a bus is 1. That makes the last line 5 + 4*1 which does equal 9. We have 3 bears and 3 hats. This adds up to 21 meaning a bear + a hat = 7. In this line we have a bear with a hat (7), a hat and a bus with a bear. In total then we have a bus of unknown value and 2 bears with hats valued at 7 each. To get the total sum of 15 an empty bus must equal 1 (15-(2x7)). There are 2 buses with a hat-less bear and one bear with a hat (7). 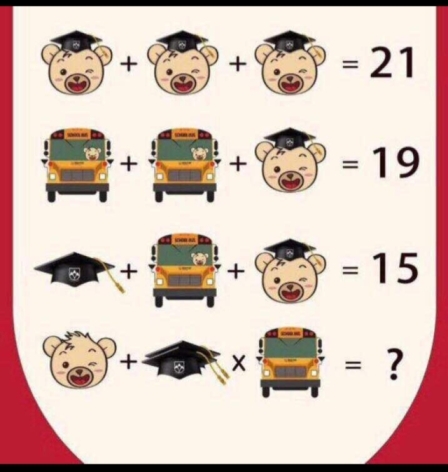 Since each bus is worth 1 and the bear with hat is worth 7, subtracting 9 from 19 leaves 10 for the value of two bears and 5 for the value of each individual bear. Since a hat and a bear is 7 and a bear is 5, a hat is worth 2. To recap: A bear without hat is 5, two hats will be 4 and a bus is 1. 1x4 (BEDMAS/PEDMAS) is still 4. All that is left is 4 + 5 which equals 9. $t=5, h=2, b=1$, therefore $t+2hb=9$. From (1) $t+h=7$. From (3) $b=1$. From (2) and (3), $t-h=3 \implies t=5, h=2$. Observation is the key in this puzzle. The bear, hat and bus can each be described as a certain variable. Let's use B = Bear, H = Hat, and S = Bus. B + 2H * S = ? Now we have a system of three equations and three variables. Not the answer you're looking for? Browse other questions tagged mathematics calculation-puzzle or ask your own question. What number should be here? Which two numbers replaces the question mark?